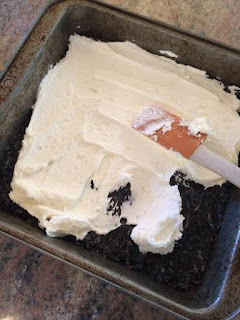 It's that time of year - I have a backlog of things that the kids and I have been baking that I really want to blog...... BUT, this one had to jump right to the front. I created this little morsel on the weekend and I feel like it's going to revolutionize my Christmas treat rotation. 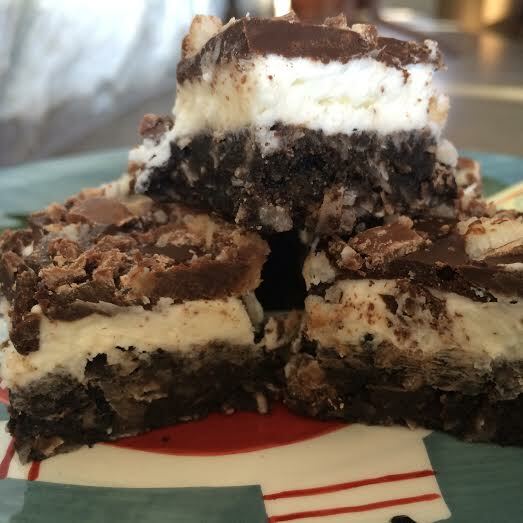 I combined two of my favorite things: nanaimo bars and coconut. Now, I realize that many of these bars already have coconut in the base. That's what inspired me to create these. If only I could make something with a coconut base, with a fluffy filling sandwiched underneath a rich and chocolaty topping. Then, what if I garnished it with some chopped coconut candy bar? The result would be THIS!! Melt butter in a small saucepan. Add cream of coconut, baking crumbs, and coconut. Gently stir until it is an even consistency (it will appear quite wet). Press firmly into a 9x9 inch pan. Place in the fridge for at least 15 minutes to set up, and prepare the filling. *Look for cream of coconut in the liquor mixers aisle of the grocery store. I use Coco Real brand. Don't confuse this product with coconut cream, which is an unsweetened, thicker coconut milk. Cream softened butter with an electric mixer. Add cream of coconut and extract. Gradually beat in icing sugar, and then enough milk until it is a soft spreading consistency. Spread evenly over chilled base layer. Combine chocolate chips and vegetable oil over low heat in a small saucepan. Stir frequently until completely melted. Remove and allow to cool until just warm to the touch. Spread evenly over filling. 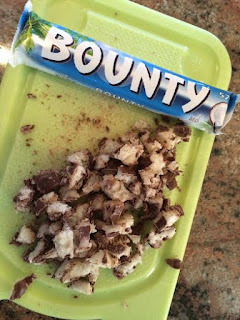 Coarsely chop coconut candy bars and sprinkle over warm chocolate.